Fur stinks because it is a part of one's body, an animal organ which is no longer in function after the animal's death, and tends to rot and decay as any other part of a carcass would, resulting in bad smell. Processing of fur, which uses enormous quantities of water and chemicals that can be carcinogenic, is meant to slow down this process and reduce the stench. Fur "stinks" because it causes pain and suffering over 70 millions of animals worldwide every year. Animal species become extinct because of fur, whilst breeding animals for fur means a long-term suffering of living beings. Precious natural resources are being used and environment polluted for fur. Fur "stinks" because violence that is "weaved" into every fur coat or garment has no justification and it requires a public condemnation of everyone who sells it, promotes it or wears it. 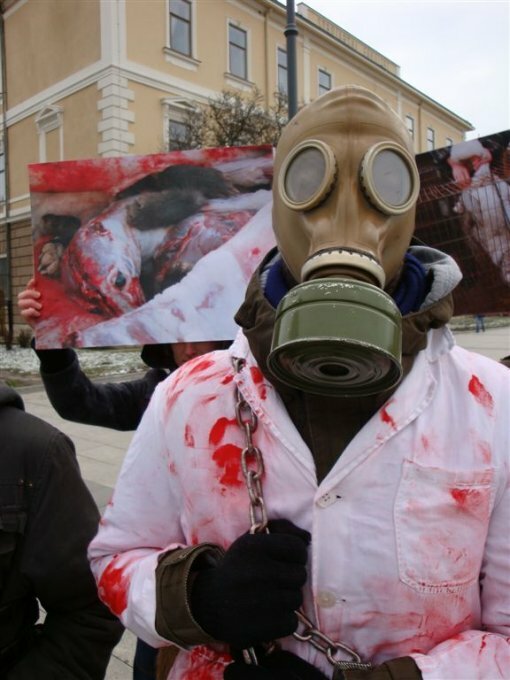 Therefore, on Thursday, February 19, 2009, at 12 noon, Animal Friends will enact a performance entitled "Fur Stinks," the aim of which is to invite citizens to condemn the killing of animals for fashion and glamour. 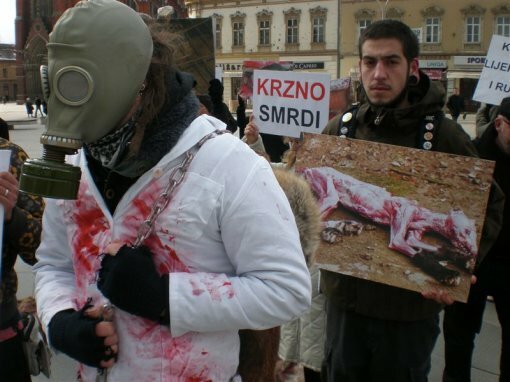 Activists will wear gas masks on the Osijek promenade and Freedom Square, dragging "bloody" fur coats on chains and showing video footage of animals on fur farms. The same day at 8 P.M. in CNC Osijek – Youth Club, Strossmayerova 68, a public lecture with the video footage "Their Future in Your Hands" will take place. Apart from "cruel fashion," the lecture will address other issues related to animal protection and animal rights. There will be time to ask questions and Animal Friends will also encourage visitors to engage themselves in animal rights in Osijek. Performance "Fur Stinks" will also take place on promenade in Slavonski Brod on Friday, February 20, 2009 at 12 noon. Most of animals are raised at fur farms where, after spending their lives in tiny, filthy cages, they are killed by gassing, electrocution, strangulation, suffocation, poisoning with strychnine, breaking their necks, or inserting red hot iron rods into their anuses. Animals that are trapped in nature freeze or burn under the hot sun, helplessly exposed to predators. Those that survive are trodden to death, strangulated, drowned or bludgeoned by the hunters in order to prevent stains on fur. Millions of "unwanted" animals such as dogs, birds, cats, rabbits, or squirrels get caught in the traps and die in agony. Under the Croatian Animal Protection Act, breeding animals for fur has been banned since January 1, 2007, with a transition period of ten years, and the final goal of the campaign "For Croatia without Fur" is to ban the sale of clothes and shoes made of animal fur. 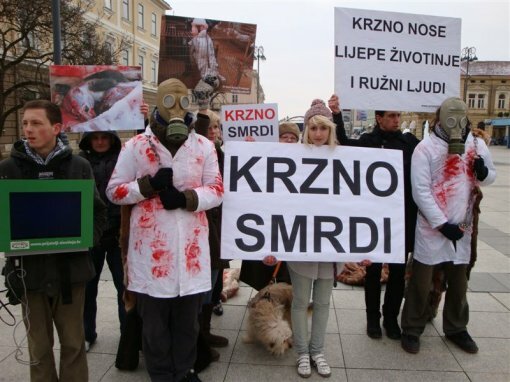 The action "Fur Stinks" is part of the campaign "For Croatia without Fur." As part of this campaign, a big protest will be also held on February 28 in Zagreb to which Animal Friends already invites all citizens.